Compact fluorescent bulbs (CFL), which come in a variety of shapes and sizes, initially cost more than conventional bulbs but have the potential to save you money in the long run because of their longevity and efficiency. Because of the different way the bulbs are made, CFLs lose less of their overall energy to heat. Incandescent bulbs, which work on a filament, lose most of their energy to heat, but CFLs which use mercury and argon working on an inside coating of phosphor, lose less of their energy this way – perhaps even up to 75% less than a conventional bulb of similar brightness. Essentially CFLs are converting ultraviolet light to visible light. Because the CFL uses less energy, its wattage levels will typically be lower than comparable conventional bulbs. 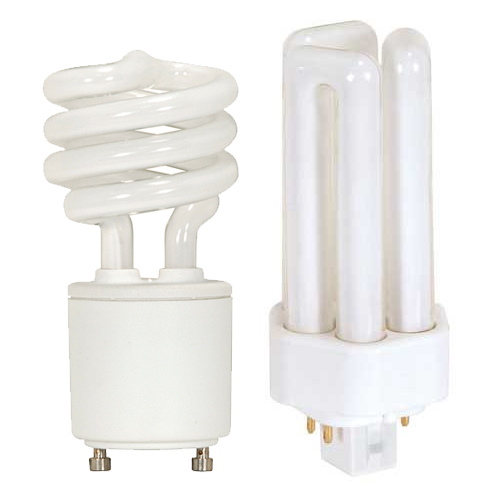 Compact fluorescent lamps (CFLs) or bulbs come in two major types: screw-in (decorative compact fluorescent bulbs) and plug-in (multi-pin compact fluorescent bulbs). CFLs can save businesses money since they use less energy and have a longer lifetime than an incandescent bulb. For example, a 23-watt CFL produces the same amount of illumination as a 100-watt incandescent bulb, using less than one-quarter of the electricity and producing less heat. Compact fluorescent bulbs do not use a glowing wire filament to produce light, and can last 5 to 10 times longer than conventional bulbs.